While we still don’t know who will end up purchasing Fox’s network of RSNs from Disney, a condition of the recently (and finally) completed Disney-Fox deal, we do have a list of bidders. That list includes Major League Baseball, which may seem odd; obviously, the networks in question show games from plenty of other sports as well, and MLB is even more obviously not generally in this kind of business. At least not to the point of dropping billions for a network of channels. Rob Manfred, though, apparently views it as an opportunity to help battle revenue disparity among teams. 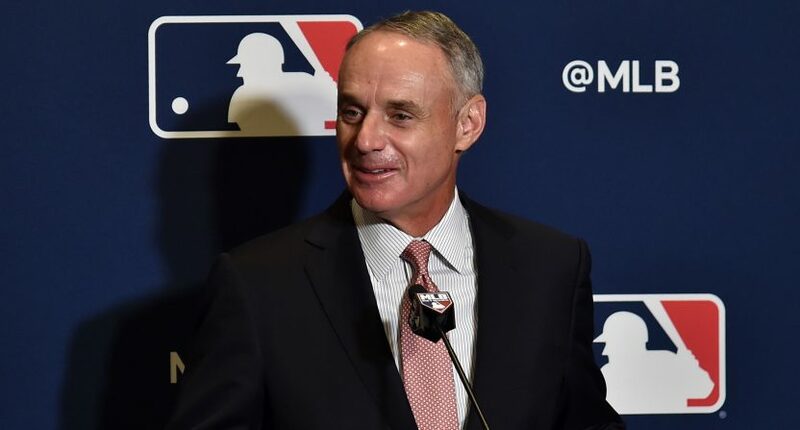 “There’s tremendous revenue disparity in our game, and I think that if we had more of a national model closer to where the NFL is it would solve a lot of those competitive issues for us, kind of level the playing field.” baseball Commissioner Rob Manfred said Wednesday. That’s certainly one way to look at it. Obviously the big market teams are at an advantage in the current system, relatively speaking. Their local rights are worth more because they have a bigger local market, and that increased revenue (theoretically) lets them spend a lot more on their team, leading to a more competitive roster, which again helps their rights values via higher ratings, and their overall revenue via all of the other traditional streams. But the idea of MLB spending billions on these networks in hopes of one day negotiating a national deal like the NFL seems like a bit of a stretch. Baseball is inherently more regional, something that the league itself has caused via years of impossibly complex blackout rules in pursuit of protecting the value of local television rights. And while addressing revenue disparity is a pretty standard way to try to sell anything to fans, there’s no guarantee this would do that. The league already has revenue sharing in place, and it seems like expanding that would be a much easier path towards overall parity, if that’s truly what the league wants. Especially as the local rights bubble continues to expand, something Manfred himself seems aware of. “You’re buying an ongoing RSN business, which generates really significant profits right now,” Manfred said. “I think everybody knows that it’s probably going to degrade over time as the cable model erodes. So, essentially, Manfred thinks that MLB can buy the RSNs, continue to operate them until they’re no longer profitable, and then once the bubble bursts, they’ll be in control of both ends of the rights agreements, and they can move on from there. There are a lot of moving parts here, and it seems like this is much more of a long-term vision than anything likely to happen in the near future.